I was reading The Idea of Justice by Nobel Laureate Amartya Sen, now in paperback, and he starts out with the following example. Take three kids and a flute. Anne says the flute should be given to her because she is the only one who knows how to play it. Bob says the flute should be handed to him as he is so poor he has no toys to play with. Carla says the flute is hers because she made it. Sen argues that who gets the flute depends on your philosophy of justice. Bob, the poorest, will have the support of the economic egalitarian. The libertarian would opt for Carla. The utilitarian will argue for Anne because she will get the maximum pleasure, as she can actually play the instrument. Sen states there are no institutional arrangements that can help us resolve this dispute in a universally accepted just manner. This supposedly shows that there is no single theory of justice, rather one should look at enhancing the redistribution of life-saving goods and removing 'injustice'. I thought his initial thought example rather curious. Instead of asking how to allocate the flute between the three children, why not ask first under which rules would the flute have come into existence? If Carla knew she would not get the flute, she would not have made it. Therefore, just add a time dimension to the puzzle, and there's no puzzle at all: only a libertarian form of justice is consistent with the flute existing. I was rather surprised that Sen didn't address this, as if goods and technologies exist independent of our allocation rules, which we then choose between. It's a bit like John Stuart Mill, who reasoned that the laws of production are exogenous, but the laws of distribution are created and enacted by human choice. That's excusable for Mill, who wrote before the marginal revolution (around 1871) and the manifest failure of socialism, but for an accomplished social welfare theorist like Sen to make such an error highlights that experts are working within a paradigm, and a flawed assumption (ie, wealth is given) makes all the resulting argument lame. There are, alas, quite a few people who believe that if the flute isn't allocated according to their favorite rule, then it is better for the world if there is no flute. Quite a few people have made the libertarian critique when Rawls proposed his "veil of ignorance" argument. And yet it continues to be taken seriously. it's the same underlying assumption that lot of people seem to make, that wealth is a pool of resources, and it's all about who is entitled to which share. maybe this view had some relevance back when owning land was everything. it somehow seems to have stuck on for another couple of hundred years though. I grew up with it back in the communist block. not so difficult to see that wealth is flow of stuff that will be generated only if those involved feel that it makes sense to them to keep doing it. in the end, the choice is between unequal sharing of blessings and equal sharing of miseries. I sure won’t read this book. "The problem of production, they tell you, has been solved and deserves no study or concern; the only problem left for your 'reflexes' to solve is now the problem of distribution. Who solved the problem of production? Humanity, they answer. What was the solution? The goods are here. How did they get here? Somehow." What about distribution of public goods? public goods are, by definition, non-excludable, like lighthouses, roads, and national defense. You don't allocate them, everyone can avail themselves of them. Let's modify the story a bit: replace the flute with a bread, Anne be an innovator who if consumes the bread at time t would produce a technology to make 3 breads in t+1, Bob is disable who is unable to work, and Carla remains the one who made the original bread at t-1. Utilitarian could make their case giving the bread to Anne at t. At t+2 if Carla comes up with a better technology, utilitarian may redistribute the social wealth again to maximize the future social utility regardless of who make breads at t+1. I think both utilitarian and libertarian arguments are about efficiency rather than justice. The difference is in which way you look at the process of creation of wealth, forward or backward. Only the question whether to redistribute wealth to disadvantaged members like Bob who never makes any contribution to wealth creation is a justice issue. Think in Rawls' veil of ignorance principle, if Carla could become disable at time t+1 a redistribution principle applied at all t sharing wealth to people like Bob is a desirable trade off of efficiency for justice. I agree, that is a silly story and where the money comes from is important, but lets say that we agree that the government should provide some services. Now the government has some money, it got it mostly from the Carlas (the producer) of this story, maybe a few bucks from the Annes (the player), and nothing from Bob (the kid without toys). Given this, where should the government put its money? Should it try and help out more Carlas? Should it subsidize the Annes? Or should it keep the Bob's from whining? Maybe the Government shouldn't do any of this, because as we already admitted, Carla's pay for most of this. But modern governments do, so its a conversation worth having. Anyone who takes the flute away from Carla is some still-undetermined combination of a criminal and a moron. I agree Sen forgot about the production issue. He also neglected David, who says the flute is his because he is strongest and will hurt anyone who denies him. Without David, there is no issue, because Carla will keep her flute, or give it away, as it pleases her. With David, there is no issue, because David will do what pleases him. Sen assumes an invisible and benevolent David whose actions define justice. He is willing to be David's brain, and is trying to recruit others to be David's brawn. I disagree with giangle's point about potential innovation. The question isn't who can provide the best return on investment, but who decides on the investment. Carla can give the bread to Anne in return for half the profit, so Carla ends up with two loaves and Anne ends up with one. But giangle's efficiency argument assumes an invisible, benevolent David with perfect foresight to identify the best investments. With uncertainty, there's no difference between taking away Carla's choice of where to invest, and taking away her property. Just because David thinks he can give Carla a good return on capital doesn't justify anything, even if he's right. So the problem of defining Justice is indeterminate, therefore....just accept mine. Not the strongest argument i've heard. No, the hidden assumption is that if people are not fed they cannot innovate. The starving, sick, disabled, and beaten down are not entrepreneurs. Related - Denmark, Canada, and Norway all have higher rates of entrepreneurship than the U.S. Seriously, the hidden assumption is that without socialist stealing there would be no innovation, because those being redistributed to do most of our innovation? Seroiusly? Relevant: See Falkenstein's frequent posts on 1 big idea. Saying we need more socialism for more innovation is idiotic. It's like the fools who say we need to go green for the "jobs". You want to argue for socialism, go for it. I think that makes you a thief or a moron, but that's just me. But claiming we need to redistribute so those getting welfare can innovate for us? Do you socialists have no shame, or can you do no better? To be clear, I didn't advocate for socialism for the sake of innovation. My point is if you throw in production, the story is no longer about justice. Think about justice as when you bring your hard earned breads home and distribute them among your children, or when you bring breads to Haiti or Fukushima after the earthquakes. I rather stick with Sen's static concept of justice than go to the dynamic world, i.e. add time dimension as Eric did, because that would surely raise a question about trade off. Besides, efficiency is more than just innovation. Think about public goods like law and order, social security, education, or even the sustainability that the "greens" advocate for. Sure, some libertarians would wish for everything private, even the police force who protects their property rights. But would that world be more efficient? If you take the flute from she who made it you are a criminal. These days criminals talk about efficiency and are called democrats. Still criminals. The interesting angle to this story I see is that the current debate about tax cuts has a utilitarian angle. One of the arguments is that tax cuts should go to the higher earners, on the theory that they can best make jobs with the capital. Totally astonished at how many people conflate socialism and the American Democratic party. I will take this example "If you take the flute from she who made it you are a criminal. These days criminals talk about efficiency and are called democrats. Still criminals. " Surely the archetypal republican who runs a corporation into the ground and then accepts a multi-million dollar payout, while the employees go jobless and hungry, is the greater criminal than the person who advocates a progressive income taxation policy in order to give advantages to those who arent born with them? People who make vast amounts of money do not innovate, because they have no need to in order to maintain their status quo. People who who are too poor to make rent cant innovate because they have to spend all their time trying to make a subsistence living. Adding a time dimension also seems to get rid of the utilitarian choice (in this thought experiment). How did Anne learn if she doesn't already have a flute? And/or, if Carla keeps it she will learn. - yes little wanna be, today's Democrats are not (except of course in the cases they are) advocating government "owns the means of production", the defintion of socialism you learned as a junior at Tufts and want to impress us with now. But they are doing the same thing the "social democracies" in Europe are doing, many of which have major parties absolutely calling themselves socialist, so go over there and lecture them about names. And, when you and your ilk called Bush a "fascist" did you mean he built Auschwitz, or that his policies were moving us somewhere in that direction? Give us credit for the same tiny amount of intelligence, we don't "conflate" everything. And, AJAY, it is almost too obvious to write, but how much innovation you get is almost solely (at the low to high end) a function of how much of the fruits of innovation you let the innovator keep. I know, letting people keep what's theirs, even if it works, it makes you feel kind of uncomfortable and squishy doesn't it? I was nice to you, I said "let them keep" pretending you had a right to it, I really should've said "didn't steal", but I'm feeling kind to the slow this morning. "If Carla knew she would not get the flute, she would not have made it" can not be true if Carla is a maximizing agent. If Bob gets the flute because he is the poorest, then Bob's relative wealth increases compared to the others. But no one's absolute wealth decreases. If production and allocation continues, Bob will no longer be the poorest, then either Carla or Anne will receive the output. Therefore, it is in Carla's both self-maximizing and group-maximizing interest to create a flute. The utilitarian perspective is the least convincing given the bounds of the scenario. It is not clear that maximizing group utility would increase Carla's individual utility. So without more information, we can conclude Carla will not act. The libertarian stance will maximize for the individual and group only if Carla is allowed to trade. Carla has the lowest relative utility from possession of the flute, so the group is not maximized. Carla must engage in trade to achieve the most efficient outcome. The quality of the argument is irrelavent. What matters is that you have credentials and arrive at the correct conclusions. Why do people call Democrats "socialists"? If they were in Europe, they'd probably call themselves socialist too. The main reason is that 1) they've never met a social welfare program they didn't like. 2)when person A pays $100,000/yr in taxes and person B pays negative $2000/yr in taxes, only a socialist would say that "we cannot afford to let person A continue to avoid paying his fair share". Democrats want us to be the people's republic of Europe. They call themselves socialists or social democrats there. But it's a hate crime if you call the Dems the truth here. If you say it the NY Times thinks you're obviously a tea party moron (something THEY have tried to demonize). Plus, Dems love to show off their erudition. They all learned junior year at Brandeis that socialism is "government owning the means of production." And they say that's not true now (well, sometimes it is). Hah, they got you. But they miss the larger point. Dems are moving us to a giant social welfare state, a giant regulatory state, and a state many of their own allies in Europe happily call socialism. Dems are socialists. At least man up and stop whining about being called what you are. Socialism is just the collective distribution/disposition of property. (The definition about 'Government ownership of the means of production' doesn't mean anything; what are 'the means of production' exactly? This may have made some sense in 19th century factory-dominated economies, not now.) Anyway, so we are all socialists to some extent - any nation-state will have to engage in some socialism, or not really be one - it's a matter of degree. In the U.S. there are two major parties, and the party that predominantly seeks to increase the degree of socialism is called the Democratic Party. Now, what's the problem with that claim exactly? Also, just BTW, by my reading, Anonymous@8:31pm didn't mention the U.S. Democratic Party or any other political party. Just saying. Back to the issue at hand. It seems to me the theft takes place in sentence #1. "Take three kids and a flute." Once you do that, I suppose all sorts of conclusions follow, but using the result to illustrate something meaningful about justice is self-contradictory, as the presence of justice would have disallowed the conditions of the story in the first place. i.e., the taking of Carla's flute for no good reason, and then holding audience with Anne and Bob regarding what to do with it. I would modify the story like so: 'Suppose you are a judge, and Carla comes to you with the complaint that Amartya Sen took her flute, and ruminated for some time upon what to do with it, making her beg to give it back.' What is the correct justice-based response to such a situation? 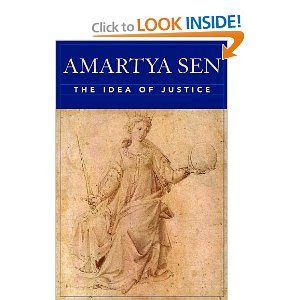 How many different 'ideas of justice' can Amartya Sen possibly bring to bear to give any answers to Carla's complaint other than the obvious one? Firstly, how many of these commentors have read the book? From most of the comments, not many. second, what does the first line of falken say ... I was reading The Idea of Justice by Nobel Laureate Amartya Sen, now in paperback, and he starts out with the following example. The key words are "... he starts out with the following example"
Read the book people. and then we can discuss it!!! Some criminal thinks that someone else should decide who should get the flute. No reading is necessary (though I'm a fan of reading) to decide that anyone who thinks that is a broken totalitarian. Go back to Amazon and be the lurker who types in a "read the book" comment about 100 times a day and feels superior for it. The reviews from The Independent, Financial Times, and The Guardian, all mention this as a great illustration of Sen's main point. These reviewers all agreed with Sen, and ignored the incentive effects. Oh, well if The Guardian disagrees with me I must be wrong. I liked Sen's thought experiment better when it was called 'The Little Red Hen'. Can't go wrong with the classics, man.